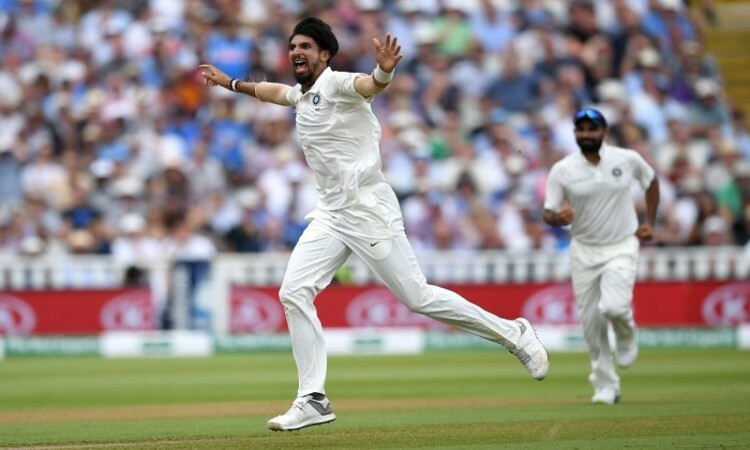 Birmingham, Aug 3 (CRICKETNMORE): India bowled out England for 180 in their second innings at tea on the third day, getting a target of 194 runs to win the opening Test at the Edgbaston Cricket Ground here on Friday. England lost Jos Buttler (1) in the second ball of the session. The right-handed batsman couldn't handle a delivery from Ishant Sharma, who picked his fourth wicket. Buttler provided a thin top edge which went to the hands of wicket-keeper Dinesh Karthik. Afterwards, 20-year-old Curran and Adil Rashid (16) tried their best in a 48-run stand for the eighth wicket. Paceman Umesh Yadav rattled the stumps of Rashid, who survived 40 deliveries. Curran stood out as he took the attack to the opposition bowlers by goig after them. He was not even afraid of off-spinner Ravichandran Ashwin, whose venomous spin fell the top three English batsmen. Curran did get some help from Stuart Broad, who scored 11 off 28 deliveries. The youngster cotniued his assault on the Indians. India saw a couple of edges not getting into the hands of the fielders. Left-hander Broad could only edge an away moving ball from Ishant as it landed at the hands of Shikhar Dhawan at first slip. Then, Curran's innings ended when his cut off a short and wide delivery from Umesh went into the hands of Karthik, brining an end to the second innings of England, who have a 13-run lead after posting 287. Brief scores: England 287 & 180 (Sam Curran 63, Jonny Bairstow 28, Dawid Malan 20; Ishant Sharma 5/51, Ravichandran Ashwin 3/59, Umesh Yadav 2/20) vs India: 274 in first innings till tea on Day 3.